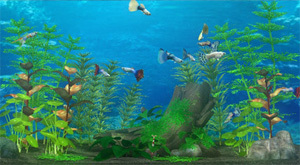 An aquarium simulator for the Wii. The screen displays your tank and you choose the fish that you want to place inside, the background type, music or sound effects, and the angle at which you want to view the aquarium. As well as simply watching the fish, you can jump to a third-person view of any fish and control them around the aquarium. Alternatively, you can pick a miniature Mii dressed in diving gear to swim around.